In Shunem, there lived a rich woman with her husband. Whenever Elisha visits the place, he would go and have a meal at the house of the rich woman. The next time Elisha come to Shunem, he stopped by at the house of the rich woman and go up to the flat roof to rest. The rich woman came and stand at the entrance to Elisha’s room. A few month s later, the rich woman became pregnant and she gave birth to a son. The father of the boy said to the servant, “Carry the boy back to his mother.” The servant picked up the boy and carried him back to his mother. The boy lay on the lap of her mother until noon and he died. The rich woman left the room and shut the door behind him. But the rich woman held on the Elisha’s garment,” I won’t leave you alone unless you go with me.” So Elisha went with them. 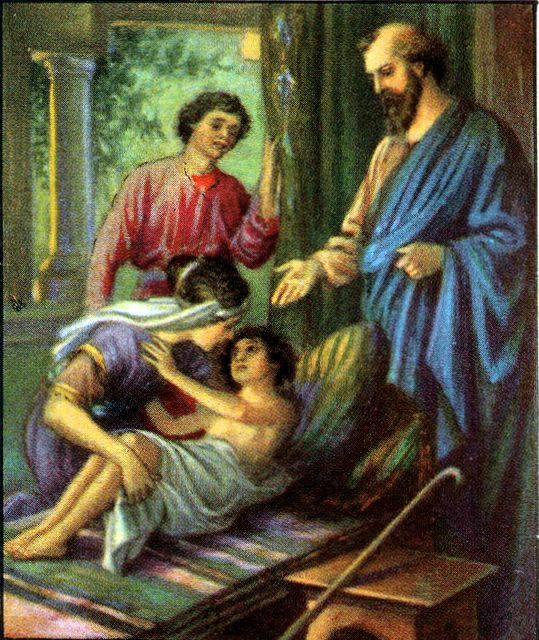 When Elisha arrived at the room of the boy, he laid his body on the boy with his eyes on the boy’s eyes and his mouth on the boy’s mouth. As Elisha laid his body on the boy, the boy’s body becomes warm. Then he walked back and forth in the room. After that, Elisha went back and lay on the boy again. The boy sneezed seven times, and he opened his eyes. Elisha showed the boy to his mother. The mother of the boy bowed down and picked up her son. Then she left.